Usborne reigns supreme when it comes to keeping children occupied, and the Outdoor Book is a great tool for encouraging your child to put down the iPad or remote and get outside. There’s something about this publisher’s house style that makes their non-fiction so irresistible for children. Page after page of old-fashioned illustrations jammed with ideas for getting the most out of the fresh air. This is a brilliant book brimming with ideas for things to do out and about in the great outdoors. Wherever you are and whatever the weather there are things to discover and explore and adventures to be had. Packed full of beautifully illustrated and imaginative ideas for making the most of the great outdoors, including step-by-step guides for things like wildlife watching and damming a stream, as well as campfire cooking and seashore hunts. Packed with challenges and ideas for fresh air activities. 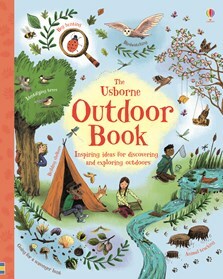 If you’re looking for an outdoor adventure this summer, you’ll find plenty of inspiration in The Usborne Outdoor Book. The perfect book to get kids out and about and exploring nature during the summer holidays. This brilliant book is a perfect way to encourage children to play outdoors... It's packed full of exciting activities you hadn't even thought of! A brilliant book brimming with ideas for things to do out and about in the great outdoors. Wherever you are and whatever teh weather there are things to discover and explore and adventures to be had. From setting up a base camp and building a shelter to catching crabs and stargazing, this compendium of wildlife skills ticks all the boxes and is a novel way of getting children to connect with the great outdoors. Inspiring ideas for discovering and exploring outdoors, whether that's a city park, a beach, deep in the woods or even in a garden. Really enjoyed the Quicklinks for this book. Thanks.